With 43 species done, September was always going to be my make or break month. Once we get into October many of the summer visitors start to drift away and more significantly I tend to get obsessed on my pike and perch fishing, so the number of times I travel to the coast declines massively. My first outing this month was to the Christchurch Grand Slam event. This takes place in Christchurch harbour and is a tournament based on your longest mullet, bass and any third species. It wasn’t somewhere I expected to add to my species list, but after a morning smashing the thin lipped and golden grey mullet on the baited spinner I headed into the main harbour looking for bass. On the bait rod, I had a single size 2 Tronixpro Aberdeen hook on a long flowing trace baited with ragworm, whilst waiting for bites on this set up I was also throwing small spinners around on the trusty HTO Rockfish Revolution. Small bass were constantly smashing the ragworm but after a dozen or so of these, I had a fish that felt a bit different. Lifting it to the yak I could see it was a small bream, but on closer examination I realised it was a gilt head bread, my very first of this species and whilst only small it made my day, giving me species number 44. 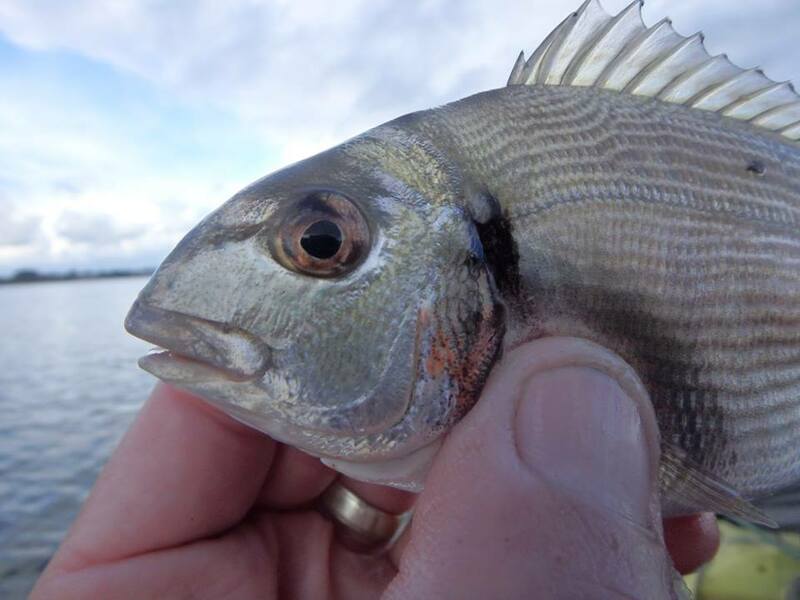 All the reports suggest that this fish is expanding its range across the South Coast and it is now a very viable target in venues such as Poole Harbour. 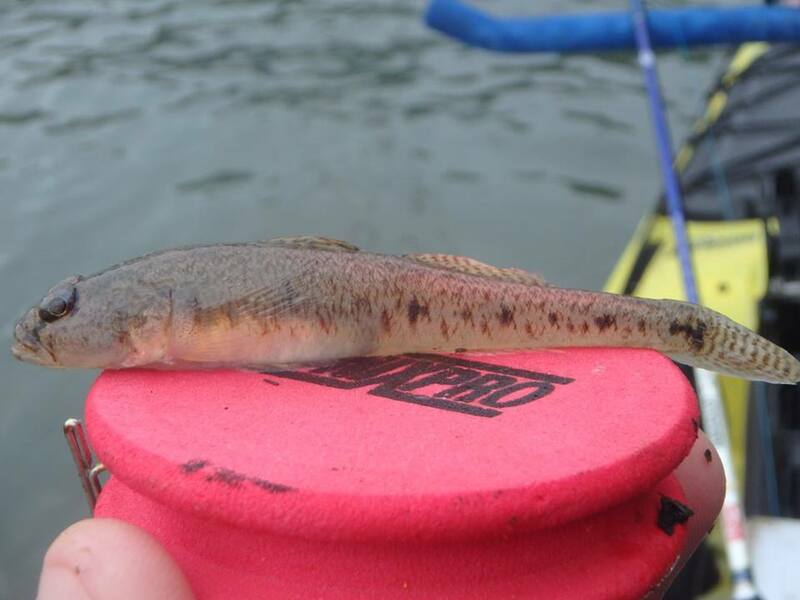 A tiny goby caught right up into the freshwater section of the river gave me species 45. 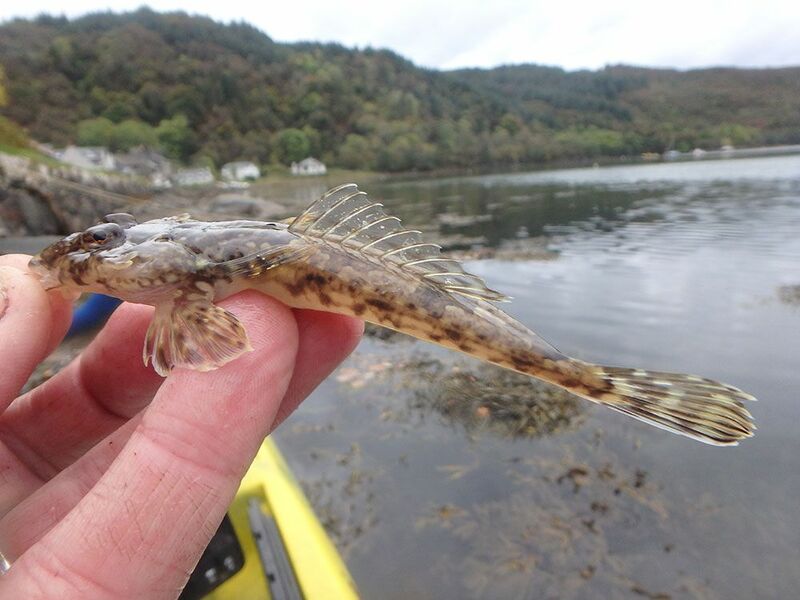 Gobies of this size are always hard to identify but based on how far up to the freshwater it was caught I believe (but am not sure) it was a Common Goby, another first for me. The second day of the event I headed right out into the harbour looking for bigger bass. I soon spotted a massive shoal of fish moving in very shallow water. Initially I thought they were mullet but something about the way they were moving wasn’t right. A flick with the HTO Rockfish Revolution and the spinner was hit instantly by a 50cm bass. The shoal was massive, just showing the benefits of having these conservation areas, and I spent a couple of hours catching one after another, the best going 64cm, which equates to over 6lb and is great fun in shallow water on the HTO Rockfish Revolution Rod and HTO Rockfish 2000 reel. Fortunately, this along with a 52cm mullet and third species was enough to give me my fourth tournament win of the year. My second outing was a repeat of a trip made last year – a 10-hour drive North to Crinnan looking for giant skate. There a plenty of opportunities for species hunting here, but it all relies of me catching a skate early because until I have that fish I won’t be spending time looking for anything else. Skate fishing from a kayak isn’t to be taken lightly, but we were a group of seven very experienced kayakers, and although five or us had never caught a skate from the yak before two of the guys had caught plenty between them and knew exactly what to do. 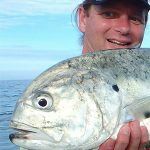 The accommodation we stay at is right on the harbour front and as soon as we arrived on the Friday night the guys had the LRF gear out and were pulling in a succession of mini species. The Saturday was a write off on the skate fishing because of the winds howling down the loch. However, that didn’t stop me heading out on the yak and trying for some mini’s that I hadn’t already caught. It was the HTO Rockfish Revolution again with my usual 2 hook scratching rig made from Tronixpro components and size 10 Sabpolo Wormer hooks baited with tiny bits of rag. I have never seen so many small coalfish and poor cod as there were around this harbour with the baits getting smashed before they hit the bottom. I was beginning to think I was wasting my time but eventually they drifted off and I soon had the fish I was looking for, a short spined sea scorpion. Species number 46. As I moved back to the front of the house in very shallow water I could see small fish darting around across the sand, dropping the same rig down here soon produced very delicate bites and eventually species number 47 was on the yak – a sand goby. Sunday, the weather cleared and allowed us onto the skate marks. Fishing huge baits in 450ft of water, this is very much a waiting game, just hoping for that one bite. I’m generally an impatient angler though, so took the opportunity to send some smaller baits into the depths. Using the Tronixpro Guerilla Boat Rod, a rod I have only been using for the last couple of months but am finding very good on the yak, I baited up a set of Tronixpro Jumbo Hokkai’s with strips of mackerel. As soon as they hit the bottom, I started to get interest and once I was sure the fish was on I struck and started winding. Honestly bringing these up from 450ft isn’t something you want to be doing every five minutes so I was hoping it was going to be something new and interesting. I wasn’t disappointed as a 4lb spurdog was swiftly lifted onto the kayak. Another first for me and species number 48. I was getting close. After a couple more of these along, along with a dogfish, I decided I needed to save my strength in case I hooked a skate, so sat out the rest of the day waiting for that bite, but to no avail. Two of our group did hook skate that day though to around 150lb so spirits were high that night. Monday, we got to the marks again and I once more just sat it out for skate. After nine hours on the water I had a screaming run. I tightened down and struck but nothing…I was fuming. However, I remembered what everyone had told me leave the bait as they will come back. A few minutes passed and then line started to peel away again. There was no mistake this time and soon enough I had unclipped from the anchor and was being towed along the loch by an unseen beast. The power of these fish is immense, I have certainly never felt anything like it from the yak. Twenty minutes in I hadn’t managed to get the fish off the bottom and was beginning to wonder what I had got myself into. A couple of the others had come over and were shouting “gentle” encouragement in a way only anglers can. Eventually I started to gain line as I lifted its head. I’d been told that once you got its head up just crank and wind and don’t stop, because if you let it get its head down it will just take back all the line you thought you had made. Seeing this fish coming up through the clear water towards me is a memory I will keep for a long time and after the obligatory photos and video it was soon swimming back down to the depths. Estimated at around 100lb, this is my biggest fish from the yak, another new species and number 49 on this year’s list. That was my week done. I’d caught the fish I came for, although I would make more attempts to target species 50. Tuesday was blown off again, and my fishing was somewhat curtailed by the amount of celebratory alcohol I had consumed the previous evening. Wednesday, we made it to the skate marks again, but just for a few hours. I had an unusual target this time, the black mouthed dogfish. I’d caught these in Norway but there are only a few places you find them in the UK and these deep-sea lochs in Scotland are one of them. 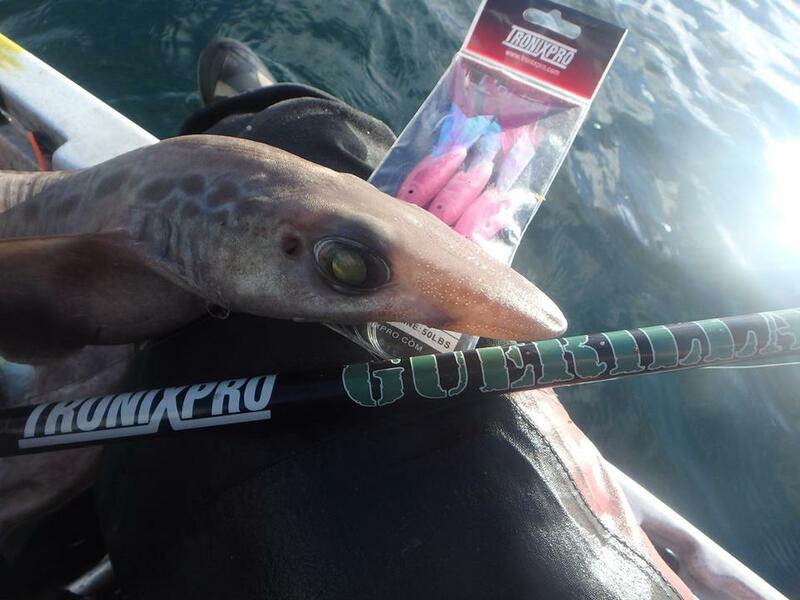 I was back on the Tronixpro Guerilla Boat Rod again and the Tronixpro Jumbo Hokkai’s baited with mackerel. However rather than having the weight on the bottom, I had rigged them so they were below the weight and would be lying loosely on the bottom, rather than rising from the seabed. Bites were instant and I soon had lesser spotted dogfish coming to the boat. It is arduous work winding these from 450ft and I was soon thinking that I was wasting my time. However, as one double shot of fish came to the surface, the back fish looked different. I lifted it right into the yak and there was no mistaking the velvety skin, pointed nose and jet-black mouth. Species number 50 was onboard. This was something I’d been trying to do for the last four years, every year learning new habitats and fish habits. I’ve become a lot better angler by learning about these varied species and becoming able to target them specifically and each year my tally has increased now to pass the magical 50. However, I had an afternoon left and I wasn’t going to waste it. A couple of the guys had caught sea trout during the week when LRF fishing so myself and Stu paddled to the mouth of the river to target these silver bars. I was back on the HTO Rockfish Revolution, but casting a 7g HTO fugitive jig around. These jigs have a fantastic action when worked through the water and seem irresistible to almost everything. Within an hour Stu had the target fish, whilst I was just getting the odd pluck. 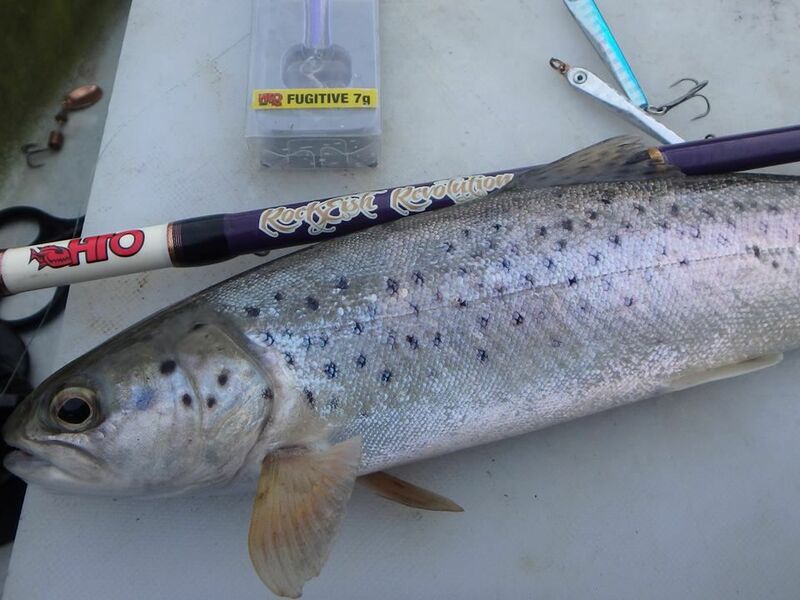 I stuck with it and eventually the rod slammed as a small but perfect sea trout nailed the HTO Fugitive. Species 51 was in the net thirty seconds later. Paddling back to the house Martin had adopted his heron pose on the harbour wall. He was sight fishing butterfish in a foot of water and had hooked one only to drop it bringing it up the wall. I paddled over and sat watching in inches of water. To my right I noticed a couple of different looking fish sitting on a rock – dragonettes. A quick change of rig and a tiny pieces of squid tentacle was soon freelined in front of them. Instantly one took it and species 52 was on board. This Crinnan trip was a real eye opener. 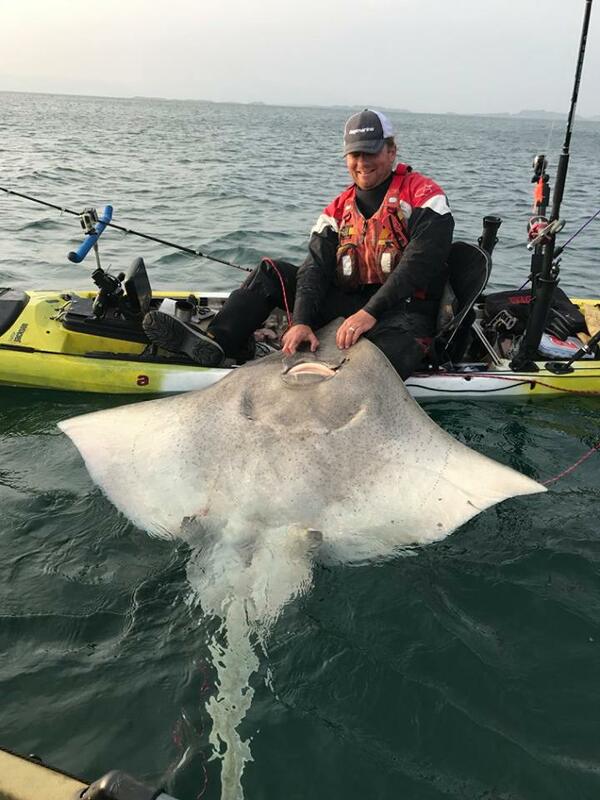 This has been a regular venue for kayak anglers targeting the skate, but usually that is all they target. If the weather is bad they forfeit the fishing. The group I was with are all a same mind set, if it swims we will target it no matter how large or small and between us we had 28 species ranging from tiny gobies, to huge skate with tope, conger, spurdog, and many others along the way and the delight of every new species caught was huge, even for a bunch of middle aged guys. I’ve achieved my target of 50 saltwater species from the kayak in a year, something not done by any UK kayak angler before. I may try and add a few more before the end of the year, but will probably concentrate on pike for the next month or so. What for next year? I always work to targets, so will have to think of something, it might not be the number of species but it will certainly involve targeting fish that I haven’t caught previously. Learning new skills and catching new fish is what keeps it interesting so why not get out and give it a go.